So I had another one of those uncomfortable realizations while musing on which book to review for this edition of Retro Friday. It came to my attention that the only Shannon Hale book I've actually reviewed is The Actor and the Housewife. That's the only one! As Grover would say, "How embarrassing . . ." I read and loved Hale's Books of Bayern long before that ill-fated meeting between myself and the Book That Shall Not Be Named (even though it just was). It's high time I went back and shared my thoughts on those first books. Because they are so good. I remember passing by the original hardcover of The Goose Girl in the bookstore and doing a double take, halting in my tracks over that cover. That unbelievably gorgeous Alison Jay cover. It was the perfect face for that story and I took it home with me that day, cradled gently in my hands. I was unfamiliar with the Goose Girl fairy tale, and it was a delight to discover it as well as Hale's unique writing. I could not wait to see what she would write next. Little did I know her sophomore novel would turn out to surpass its predecessor (at least for me) and give me a heroine who would take up residence in my mind and heart for many long years to come. At some point, I'll go back and review the first book. But for now we'll go with my favorite. Enna has gone back home. After the escapades of the year before and the marriage of her best friend Isi to the prince, Enna is ready for a measure of normalcy. And she intends to find it among the familiar trees and hollows of home. But fate seems to have a different story in mind for the chicken girl. Just as neighboring Tira flexes its muscles, intent on war with her homeland of Bayern, Enna stumbles upon a frightening ability. Fire laps at her fingertips. With the flick of her wrist she can set whole cottages ablaze. With every good intention in her heart, Enna sets out to do her part in the war effort, spying on Tiran enemy camps and using her new-found power to burn to help her people. She is joined by her old friends Finn and Razo as all three take on new (sometimes uncomfortable) roles in the name of defending their homes. But fire is insatiable. And soon Enna can no longer keep it contained within her own fragile frame. The battle turns inward as the once carefree girl becomes a conduit of flames. And when she is captured by a charismatic captain in the Tiran army, the line between right and wrong blurs amid the swirling smoke and haze. She hated it when her hair touched her neck. She also hated having dry fingertips, music without drums, and potatoes without salt. For some reason, I just love that description. It tells me everything I need to know, from the voice of a friend who goes way back. I can see, taste, and feel Enna through Razo's words. And she is truly a heroine made for me. She burns. Literally. Enna can set whole armies on fire. And does. Several times. Not perfect and not a princess, she's just a girl. A girl who loves to laugh and fights for her country. And this girl, this girl I would be friends with, goes through a lot of pain before coming to terms with the consequences of burning. But when she does, she comes to terms with a vengeance. 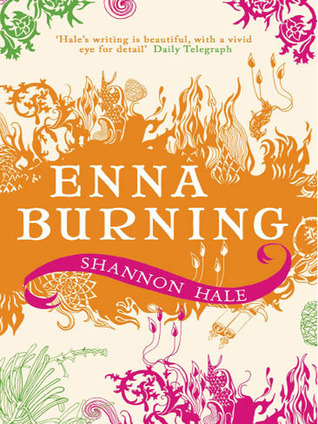 And, when she is literally on the brink of losing control and burning herself up, Enna proves her mettle by forcing herself to harness the fire in order to help Isi. It is her friend that reaches her and the two of them risk their lives for each other. This friendship between these two young women is so much of what seals Enna Burning's place in my heart. It's there in the first book, but it comes to fruition here. I remember listening to Ms. Hale speak about these two books and the reactions she got to them. She spoke of how many people who loved The Goose Girl (including her mother!) were disappointed with Enna Burning because Enna makes some big mistakes. She is not always firmly on the side of right. She struggles, is attracted to the fire and the darkness, in short she has layers. As for me, give me protagonists like Enna every day of the week. Because she's like me. Her days are hard. She wants so much. She's reckless and afraid and well-meaning and full of messy, glorious life. It is these wonderful gray areas that explain why the book resides on my Beloved Bookshelf. I love her relationship with Finn. I love how it dances back and forth, how Finn forces Enna to see him, and how she must make the choice in the end. In that way, their friendship echoes Anne Shirley and Gilbert Blythe to me. I love Sileph and the twisted, painful thing that grows between them and how much Hale made me ache for a character I could just as easily have hated. And she does it in such exquisite words. Hale manages to imbue the tiniest inanimate object with a wealth of emotion and movement, with the result that her worlds feel so tangible and real, you forget they're not. That you don't live there. That you haven't all your life. Every time I return to it, Enna and Finn are there. Razo's hair is spiky as ever. And it is so good to be back. I need to reread this one soon. I remember loving Enna for being different from Isi. It's nice to read about the princess, but it's great to relate to the regular girl. She's quite different from Isi. Much more my speed. I read The Goose Girl a couple of months ago and loved it and all of Hale's Books of Bayern were the Kindle daily deal one day last week, so I took the opportunity to buy them all. 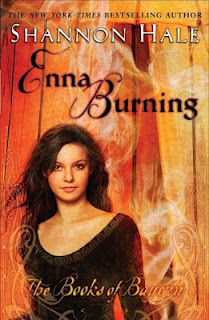 My experience with The Goose Girl, as well as your review here of Enna Burning, makes me confident that reading all of her Books of Bayern will be well worth my time. I really like that description of Enna, too! It's an unusual way to think of people, but I feel like that is solid characterization. I wasn't sure how I'd feel about another story about this world that isn't directly influenced by a fairy tale. I'm still not quite sure, but I feel more relieved after reading your praise of Enna's characterization. I loved Isi, but I suppose she does have that slight bit of distance and unrelatability that a princess can have. You've made me all excited to read Enna Burning soon! I saw that deal! Awesome. I hope you do get to it soon. Please let me know. Hm. Sadly, her adult stuff is not my favorite. And it's one of those unusual instances of the author's writing being markedly different from one genre to another. Like REALLY different. She's at her very best in young adult fantasy/fairy tale. PRINCESS ACADEMY is not one of my faves either. But these ones are worth your while. I would totally pick up copies to have signed and then read! I think the only Hale I've read is The Goose Girl. Er, well I listened to that one. Hearing that this one is better than that one gets me excited because sometimes I get in one of those moods that only fun fantasy can fix. That middle cover (and the right one!) are just beautiful. Must acquire. I think there are just some descriptions that are quick sells for me: "A romance like Lizzie and Darcy," for one. You hit another one with your Anne and Gil friendship statement. I love their witty dialogue and barely constrained attraction/hatred. I know that mood. And I think ENNA would fit it nicely. I've mentioned it before, but it occupies the same space in my mind as VALIANT does in Holly Black's Modern Tales of Faerie. And INK EXCHANGE in Melissa Marr's faery series. Though Hale's writing is superior here. But they're each the darker, conflicted middle book and I love them for it with all my dark, conflicted heart. Livi, it's hard to top those fairy tale retellings, I agree. THE GOOSE GIRL is deserving of all the love.